Smart business idea? HP is not the first manufacturer to bring a slim 10-inch tablet onto the business market - but never before has this concept been realized that consistently: for around 1,000 Euros (~$1319), the buyer not only get Intel's fastest Atom processor, including 4 GB RAM and 64-bit operating system, but also an integrated LTE module as well as different safety features. Nowadays, tablets are first and foremost entertainment devices - browsing, video playback and simple casual games count among the most used applications on the iPad & co. 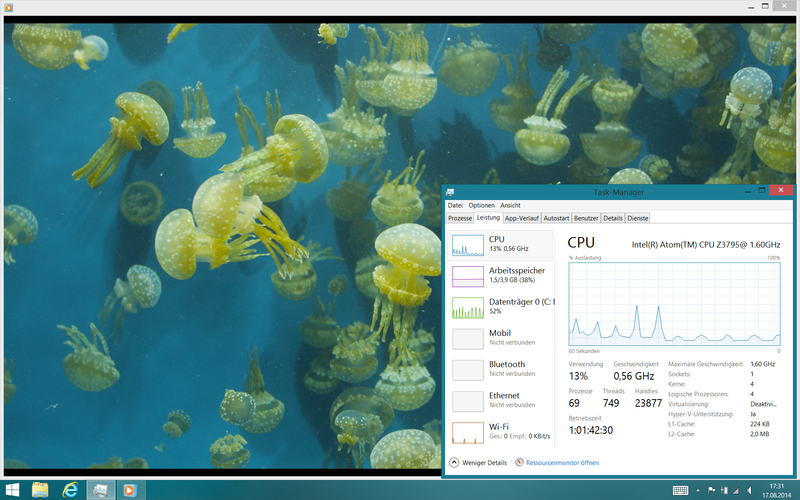 However, the versatile devices have become more and more important in the business segment; not least because Windows 8(.1) is a modern, x86-based platform with useful touch support. 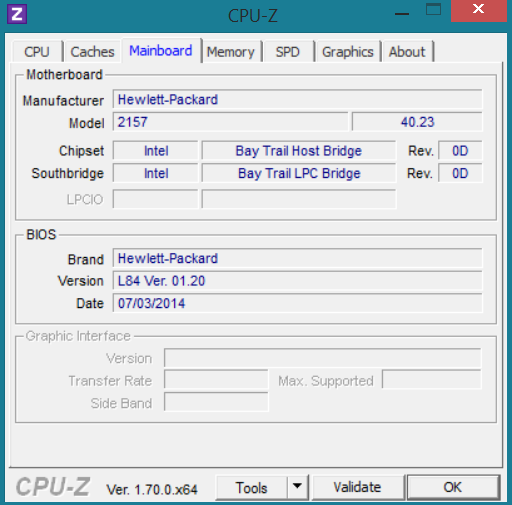 Especially devices with Intel's Bay Trail SoCs have become more and more popular. 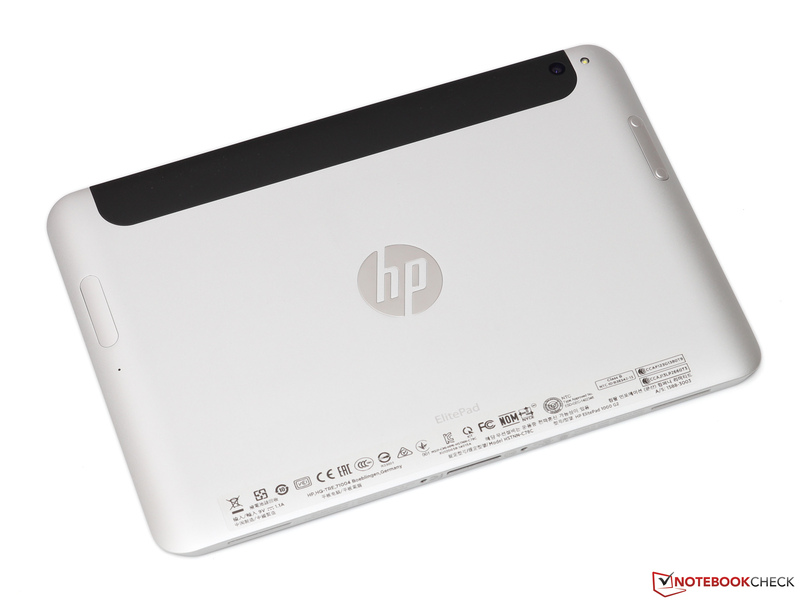 After Lenovo released its ThinkPad 10 a couple of weeks ago, we would now like to pay attention to HP's ElitePad 1000 G2. At first glance, both competitors show many similarities: next to the previously mentioned Bay Trail processor, more specifically the Atom Z3795, both tablets are equipped with a 10-inch WUXGA display as well as with an (optional) LTE radio. 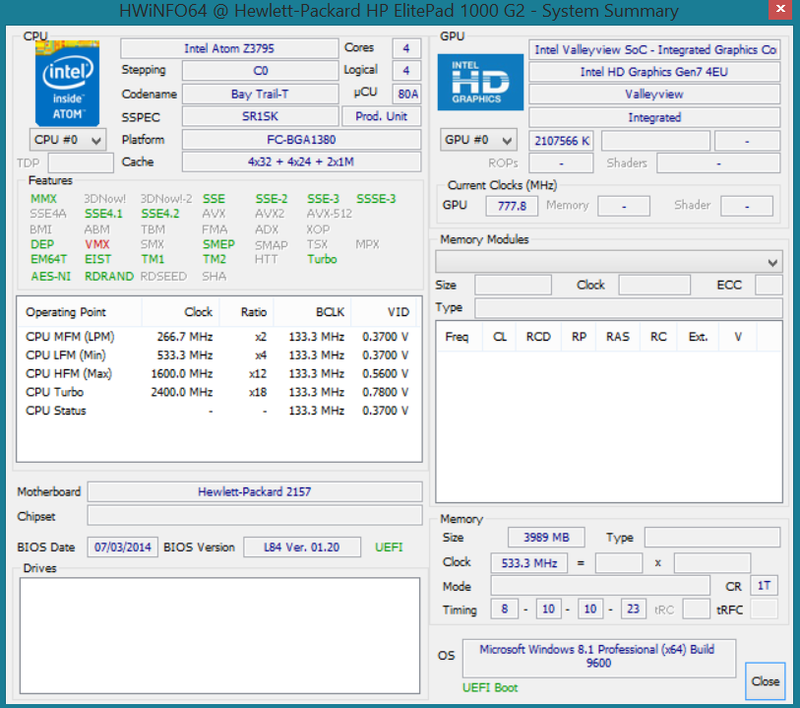 While Lenovo solely relies on 32-bit Windows, HP installs the more promising 64-bit version. In combination with 4 GB RAM and 128 GB flash memory one has to pay 1,000 Euros (~$1319) for the ElitePad - around 150 Euros (~$197) more than for a similarly equipped ThinkPad 10. For such a premium price we also expect premium quality. 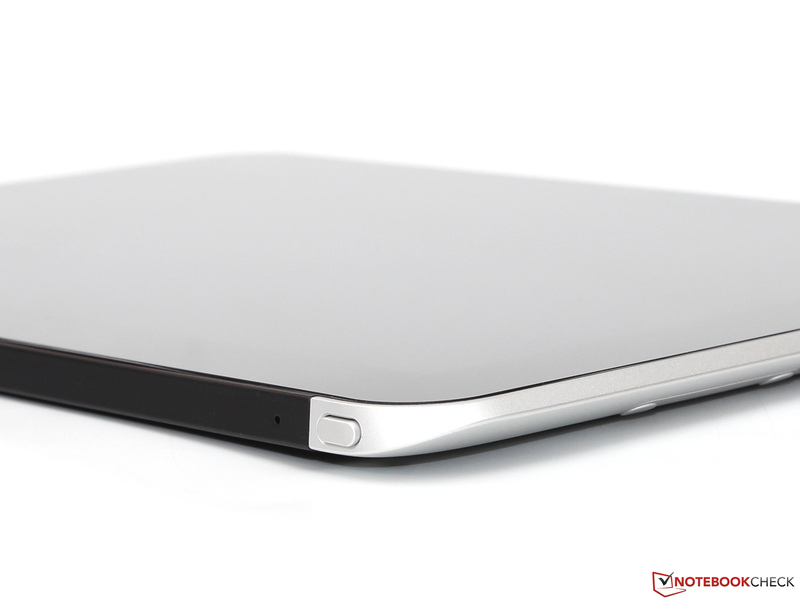 To satisfy this goal, the manufacturer uses a high-quality aluminum chassis, which covers almost the entire back of the tablet. 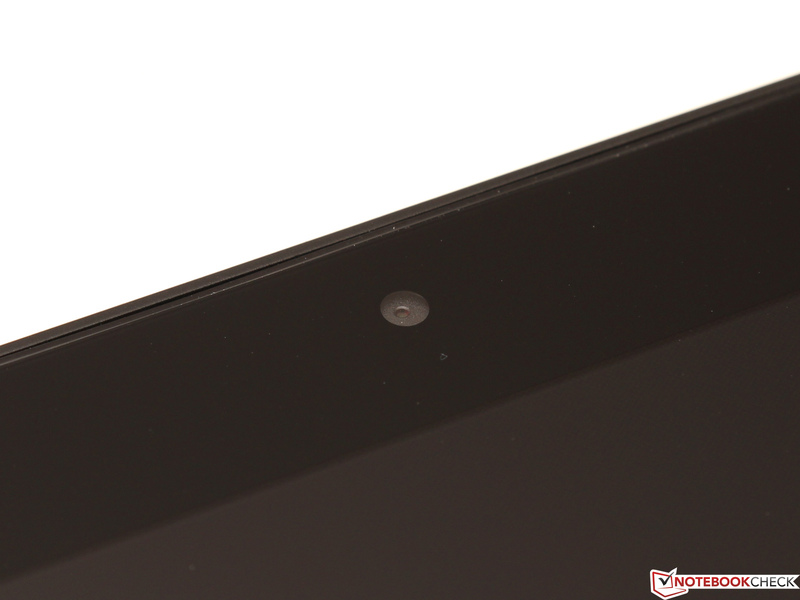 Only a small strip on the top edge is made of dark plastic with soft-touch coating in order to not influence the reception of the integrated antennas. The front consists as usual of the display, which is hidden behind a layer of particularly resistant Corning Gorilla Glass 3. With a thickness of 9.2 millimeters and almost 700 grams, the ElitePad is slightly thinner, but significantly heavier than Lenovo's ThinkPad 10 (10.3 mm, 576 gram). However, our device scores with its higher torsional rigidity, which HP confidently advertises with the slogan "it's built to last." However: despite good processing qualities, some smaller flaws can be noted - the chassis creaks subtly when it is compressed at the transition between front pane and frame. These details will not influence reliability and durability of the device. 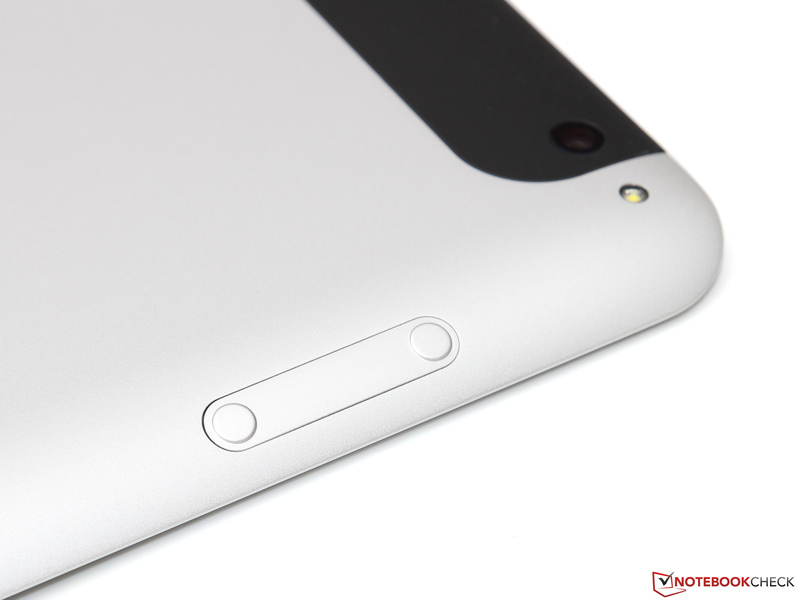 Despite its professional orientation, the ElitePad does not offer many interfaces. On the contrary: without additional accessories, the user is restricted to a microSD slot, an audio jack (3.5 millimeters) and the so-called "system connector." The latter is not only meant for charging but also allows for the use of different docking stations (more on that later) and adaptors. A corresponding USB 2.0 cable was included, further variants are available for low prices in specialty stores (for example, adaptors for HDMI/VGA, around 43 Euros, ~$56). With the exception of the newest Wi-Fi turbo IEEE 802.11 ac, the ElitePad supports almost all important, modern radio standards. 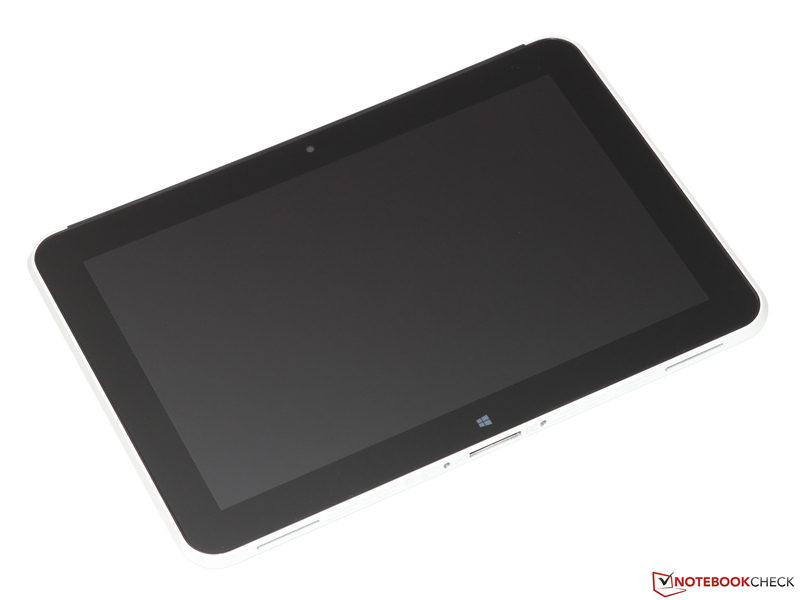 The tablet communicates with 802.11 a/b/g/n wireless networks, which send within the 2.4 or 5 GHz frequency bands, and it achieves data rates of up to 300 Mbit/s (2x2 TX/RX). In the test with a TP-Link Archer C7 router we could only achieve around 7 MB/s under practically relevant conditions (one brick wall, around 4 meters beeline). 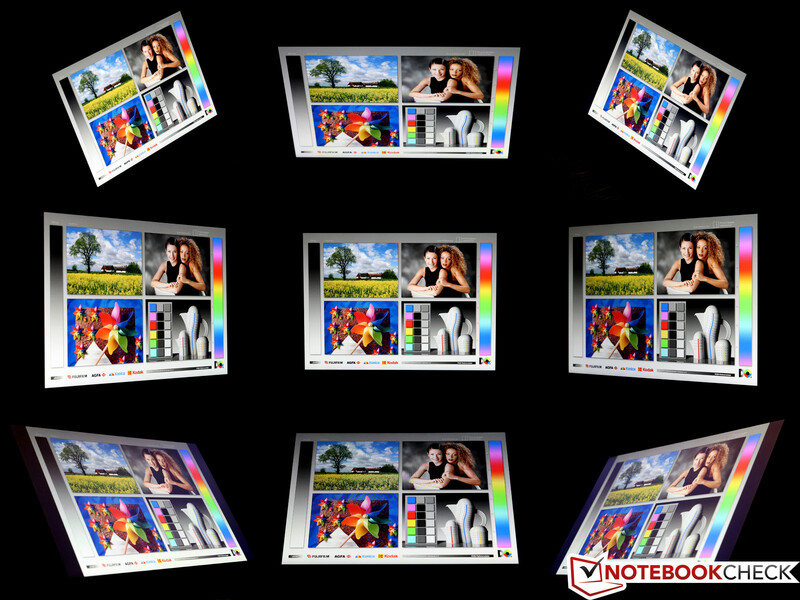 However, we think that the high range and excellent stability of the connection, which is indeed on the level of a similarly expensive business notebook, are more important. 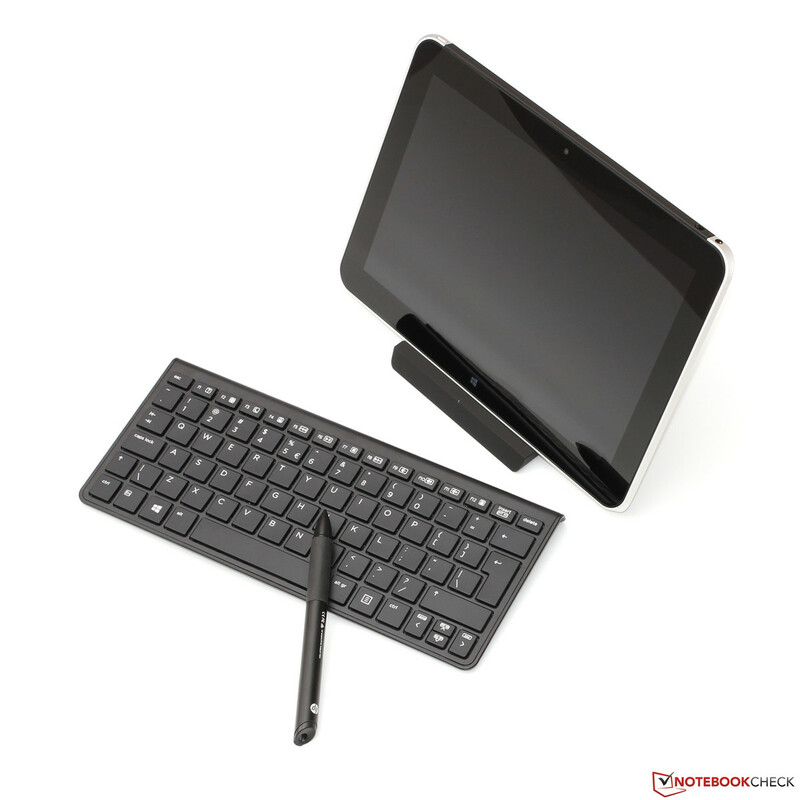 The Bluetooth 4.0 interface, which allows for an external keyboard for example, performs equally flawless. Next to Wi-Fi and Bluetooth, our configuration has an integrated LTE module which is also responsible for the high purchase price of the tablet. If you want to save some money, you should go for a slightly slower HSPA+-modem or renounce to any kind of WWAN support. There is a camera on both the front and back of the device in order to be well-equipped for video chats (2.0 megapixels) as well as for sophisticated photos and videos (8.0-megapixel, autofocus and LED flash). In terms of quality we are nevertheless disappointed: While the high resolution main sensor has acceptable sharpness, but pale and washed-out colors, the smaller webcam behaves the other way round. In general, better results can be achieved with a current mid-table smartphone. 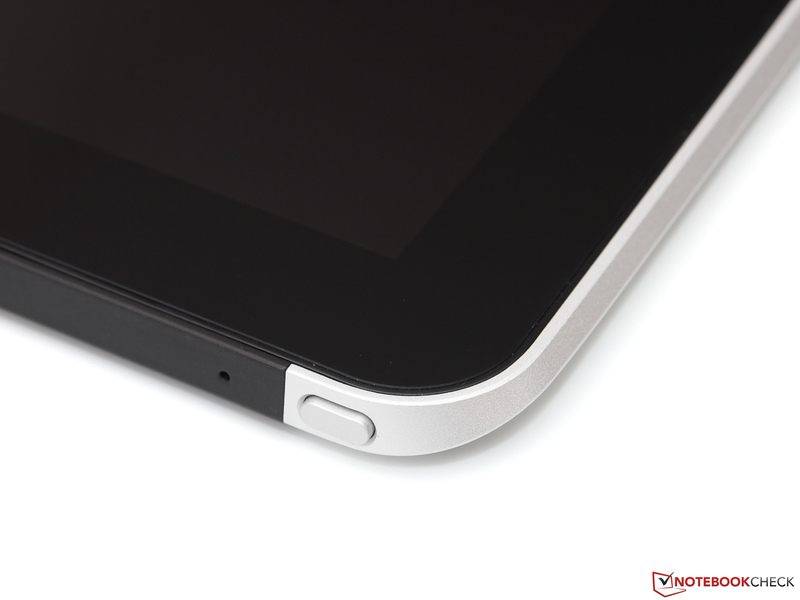 Even though the user has to renounce a few classical safety features such as fingerprint scanner or Smart-Card reader, the professional orientation of the ElitePad is clearly recognizable. Next to the mandatory TPM (Trusted Platform Module), this orientation becomes apparent when considering the preinstalled software package, which includes tools such as HP Client Security (password management, drive encoding, safe delete of data). 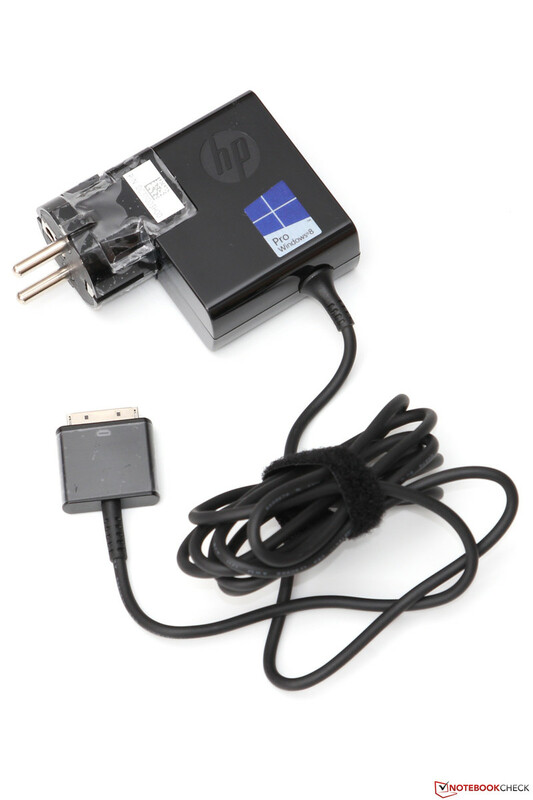 For our test, HP not only provided us with the actual tablet but also with various accessories, which (depending on the chosen configuration) have to be bought separately. 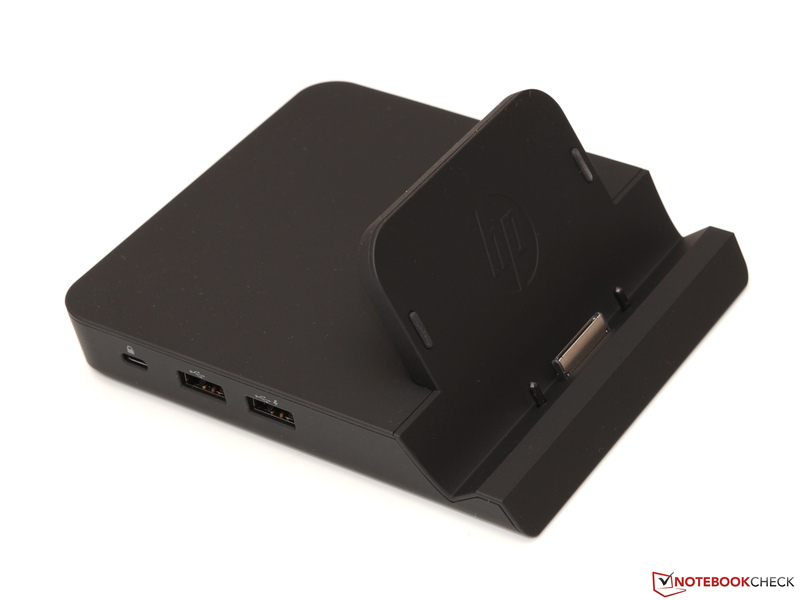 All models are probably equipped with a compact 10-Watt adaptor; alternatively we recommend the ElitePad Docking Station (C0M84AA, 150 Euros, ~$197). 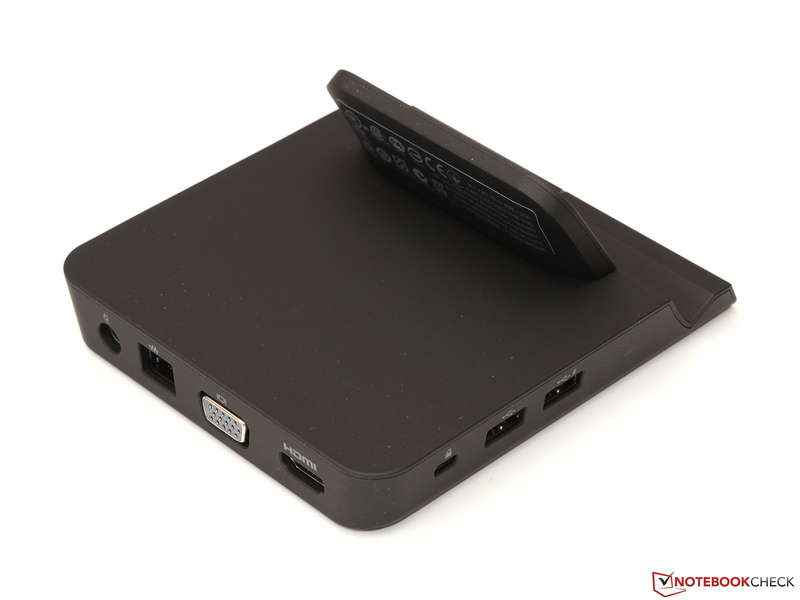 Next to a more powerful 40-Watt adaptor for a shorter charging time, the docking station adds several useful interfaces (4x USB 2.0, VGA, HDMI, Fast Ethernet). Besides, several covers or so-called "Jackets" with additional interfaces or secondary battery are offered. Details concerning the optional input devices can be found in the next chapter. Not so business-like is the short warranty of only 12 months. At the time we tested the device, we could not find any possible upgrades, also called HP "Care Pack." 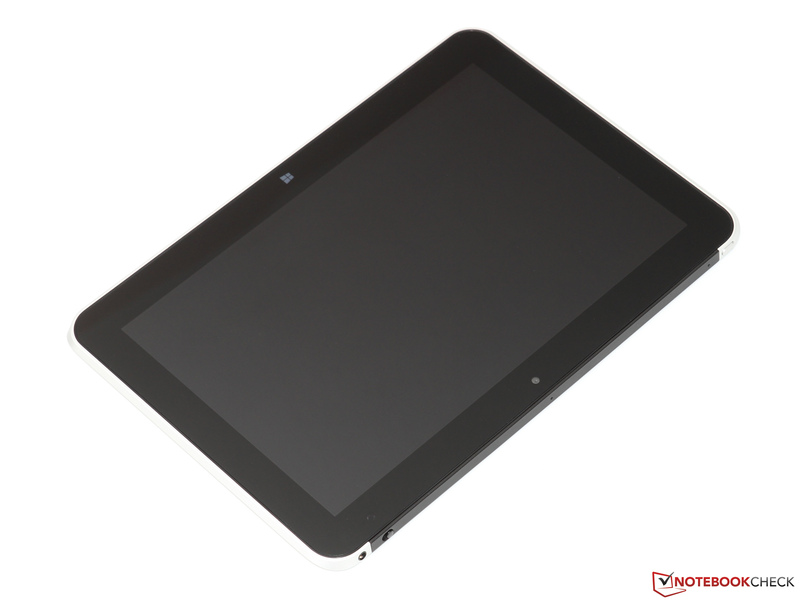 As for any other tablet, a touchscreen is used as central input device, in that case a capacitively working touchscreen. 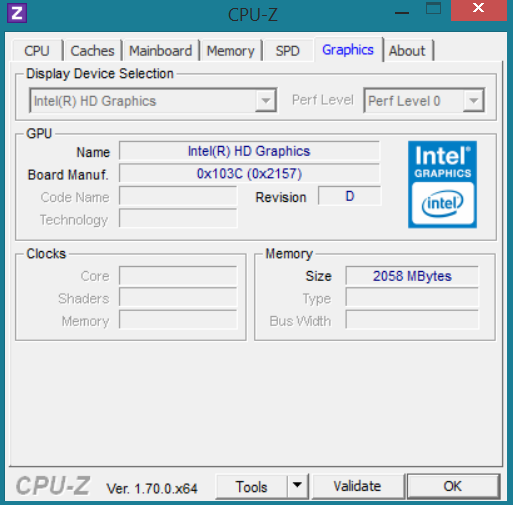 Precision and sensitivity are no points of criticism; nevertheless, certain actions (for example, moving a window on the desktop) are not as direct and smooth as a Haswell-based device. To most users, this will become only apparent - if at all - in direct comparison and is due to the slightly lower performance of the Atom SoCs in combination with the relatively high display resolution. 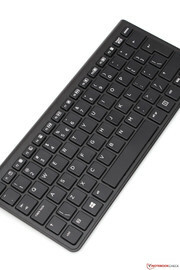 We do not go into detail for the known Windows 8 display keyboard. 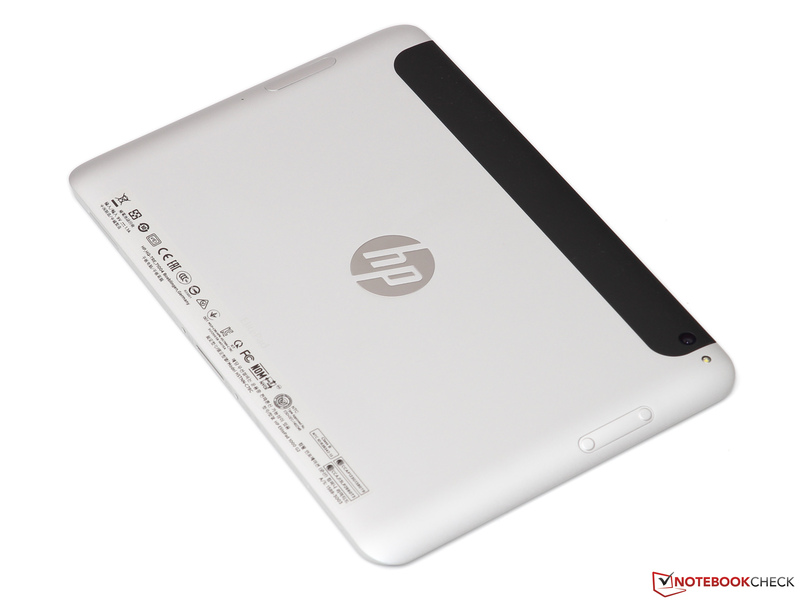 Instead, we would like to emphasize the large amount of optional accessories that HP offers for the ElitePad. Among other things, the HP Bluetooth Keyboard K4000 (F3J73AA), which convinces with a thorough processing quality and stable construction, can be purchased for 35 Euros (~$46). 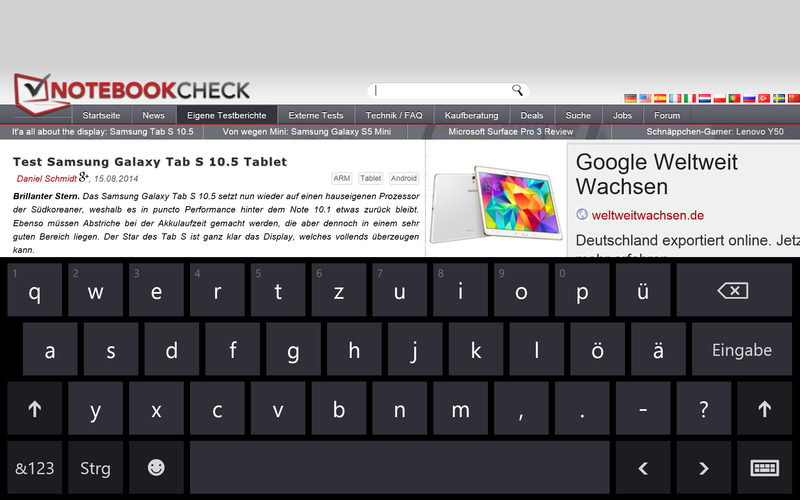 Keystroke and typing feel are also on the level of a high-quality business keyboard. 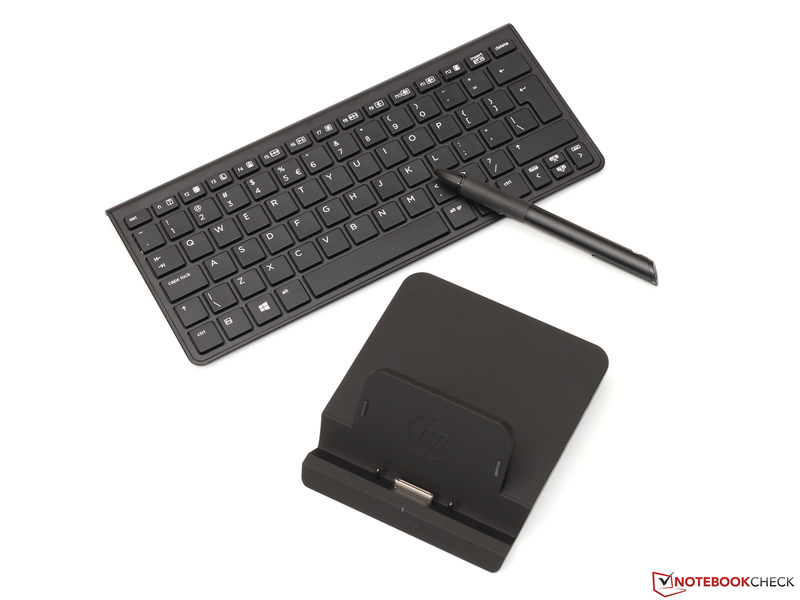 There is also a digitizer support for the tablet which allows for the use of active input pens like the HP Executive Tablet Pen G2 (F3G73AA, around 50 Euros, ~$65). 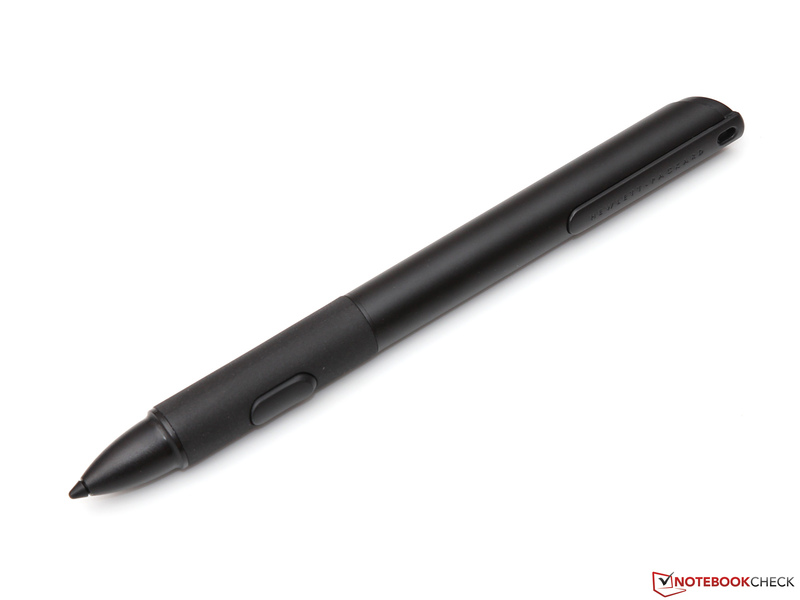 Its very thin tip as well as the convincing precision (deviation less than one millimeter) facilitates handwritten inputs especially. Just like for Lenovo's ThinkPad 10, the ElitePad 1000 G2 display has a resolution of 1920x1200 pixels, which corresponds to 16:10. In terms of screen size of 10.1-inch, pixel density amounts to 225 ppi – not really record-breaking, but sufficient for a sharp representation from a typical viewing distance. With that, HP avoids problems with older Windows software which is often only conditionally suited for extremely high-resolution displays. Especially for a glare tablet screen a strong background illumination is essential. Our test device achieves around 300 cd/m² at maximum setting; considerably less than Lenovo's competitor (388 cd/m²) or the Venue 11 Pro (436 cd/m²). For indoor use, where values of more than 200 cd/m² are barely needed, this does not restrict in particular, but it might lead to problems for outdoor use - more on that later. The slight backlight bleeding of our test device is also unfortunate: especially for darker images, the area around the edges shows irregular lightening, which strikes negatively when watching, for example, a movie. However, the IPS panel from the manufacturer AUO shows deep black representation (0.32 cd/m²) and a corresponding high contrast ratio (963:1). Regarding this, the display can even compete with the iPad Air (1.145:1); only the OLED technology from Samsung remains out of reach in terms of image quality. Nonetheless: considering the bold and vivid representation of the ElitePad, it is almost a pity to use it solely for pure office work. Due to software problems, we had to renounce to our usual image calibration, but the display seems to have decent settings at delivery condition. Most colors and grayscales show DeltaE values that are significantly below 4; but we also do not want to withhold the fact that some blue shades show flaws. 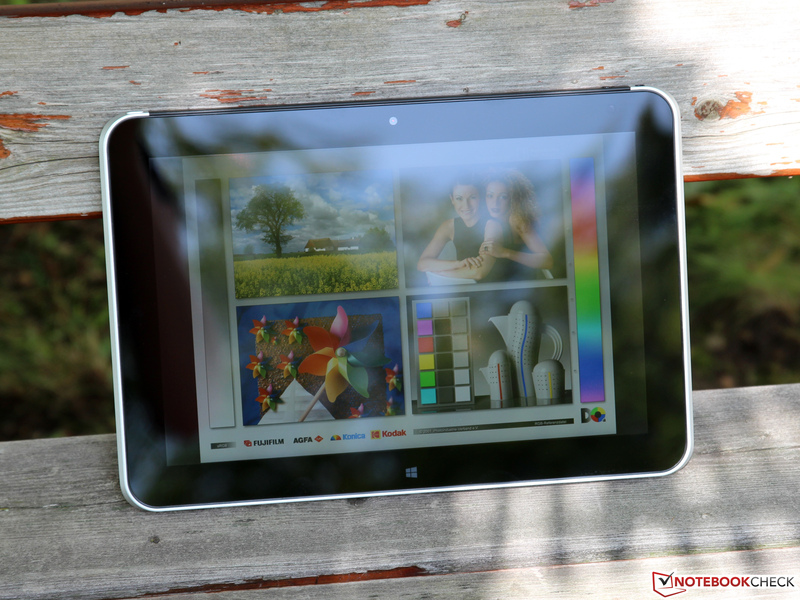 Taking everything into consideration, the tablet will satisfy most demands of hobby-photographers and occasional PhotoShop users; the device was not conceived for professional graphics designers anyway. As already mentioned, the moderate maximum brightness of the ElitePad is not best suited for outdoor use. While annoying reflections are not too apparent in shady areas, working in direct sunlight is much more difficult. If one tries to avoid such situations, no further problems should result. 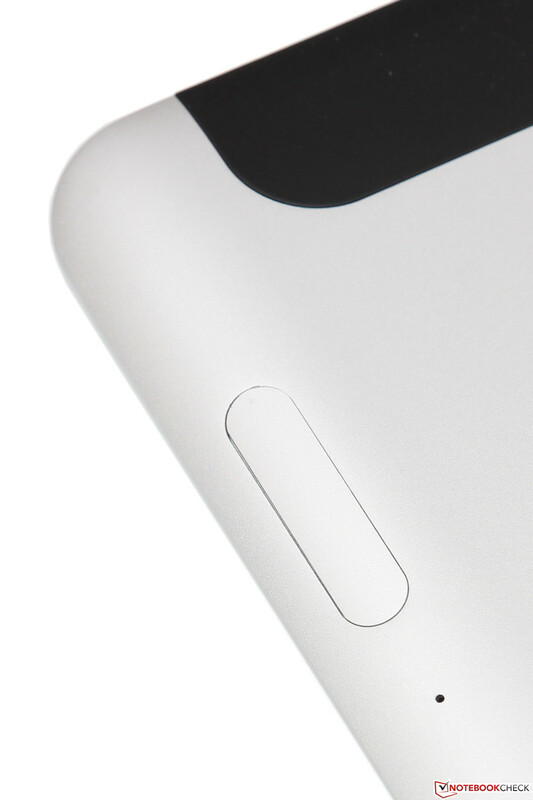 Finally, we would like to pay attention to the viewing-angle stability. As typical for an IPS panel, we can almost only mention advantages: it does not matter whether from top, bottom, left or right - the image remains flawlessly readable and does not show any distortion or significant contrast decrease. Fortunately, TN panels within the tablet market are barely used anymore, not even for significantly cheaper models. An Intel Atom processor for a tablet within the 1,000 Euros (~$1319) class - HP's decision not to integrate a high-class Haswell chip within this price range can be considered bold. 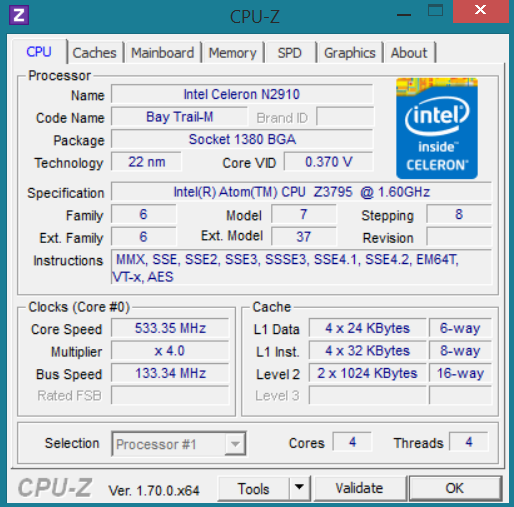 At the same time, the manufacturer decided to use the top-version of the Bay Trail T series, the 1.6 to 2.4 GHz fast Atom Z3795. The quad-core, which is produced in a 22 nm process, lacks some features and performance, but it has an extremely low power input (2 Watt SDP, probably below 4 Watt TDP). 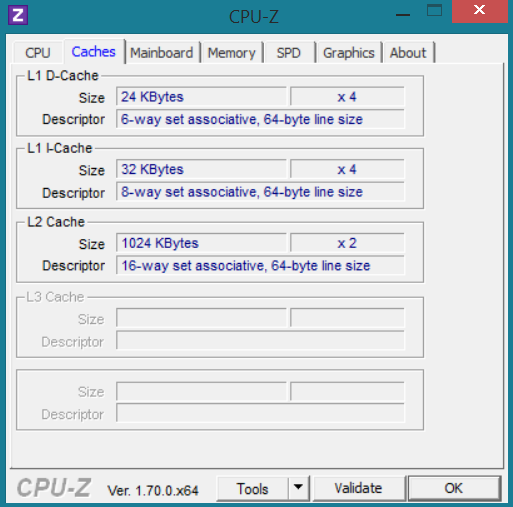 As SoC (System-on-a-Chip), the Z3795 integrates a graphics unit, CPU cores, memory controller and Southbridge with I/O-ports on one chip. Next to the processor, there is 4 GB LPDDR3 RAM (533 MHz, 17.1 GB/s) which makes the ElitePad well equipped for the 64-bit version of Windows 8.1. The eMMC flash memory, which is 128 GB for our test device, is also generously dimensioned. The name "Atom" might still evoke bad memories from earlier notebooks, but the current Bay Trail generation has almost nothing in common with the CPUs of that time. Due to a drastically improved architecture, higher clock speeds and four cores, performance is impressive: the Z3795 performs the single-thread test of Cinebench R11.5 with a full 2.4 GHz and achieves a score of 0.44 points - around 10% more than the AMD A4-5000 with active cooling and significantly higher TDP (15 Watt). 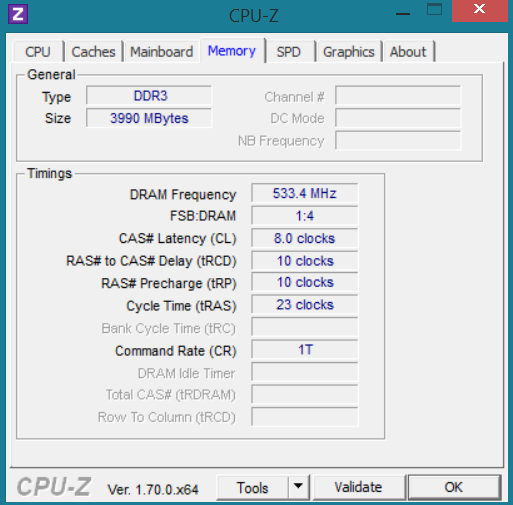 Similar differences can be also noted for the multi-threading benchmark, where we measured a clock speed of 2.26 GHz and 1.64 points. These values also remain constant when running on battery only. Another interesting comparison is the duel with the Core i5-4202Y, one of the few Haswell models than can be passively cooled. While the Atom can keep up with this core when all units are loaded, performance per core is only half. 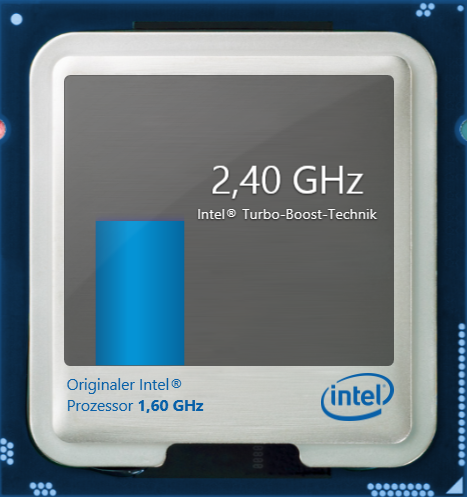 This is the disadvantage of the significantly lower power input of the Z3795. Unlike the Surface Pro 3, where a conventional mSATA SSD is used, the ElitePad relies on an eMMC drive – the same technology is also used for most smartphones and ARM tablets. 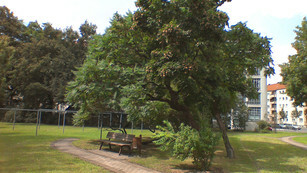 The advantages of such a memory are especially space and energy related, whereas performance is significantly decreased. Read (82.4 MB/s) and write speeds (24.6 MB/s) cannot stand out when compared to a cheap USB 3.0 stick, and also the seek time of around 0.5 milliseconds is relatively bad for a flash memory. 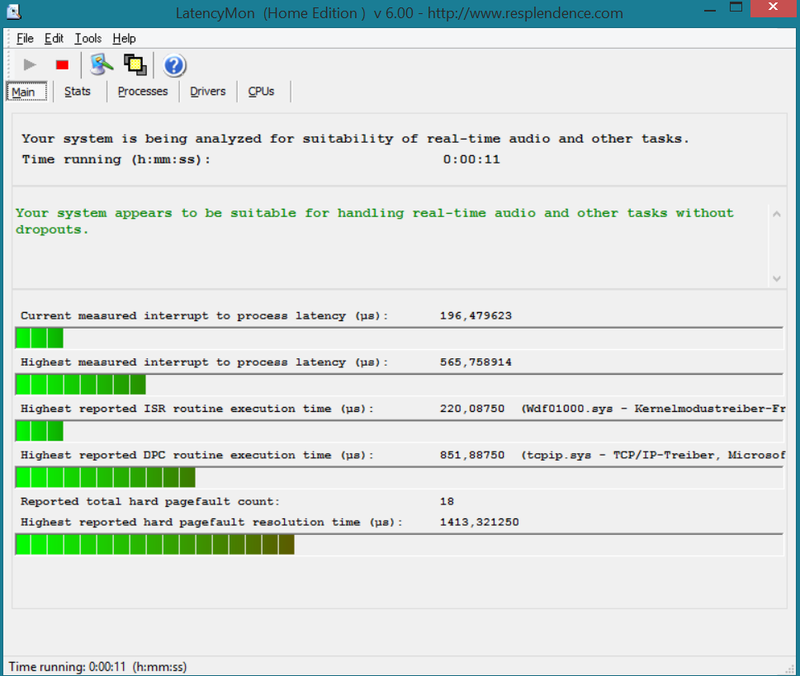 More performant solutions are provided by the ThinkPad 10 and the Dell Venue 11, but they also cannot keep up with a "true" SSD. 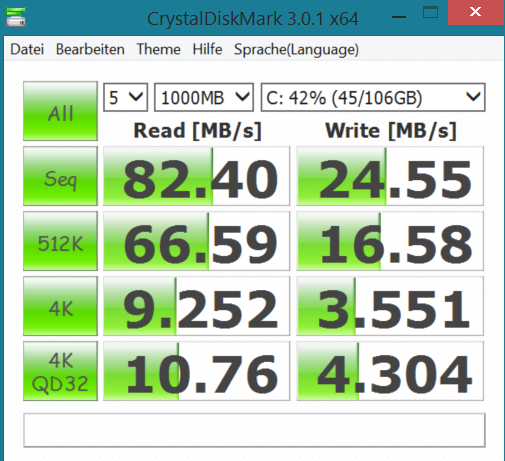 Despite smaller differences for processor and storage medium, PCMark 7 shows an almost similar performance for our three Bay Trail tablets: ElitePad 1000 G2, ThinkPad 10 und Venue 11 Pro. 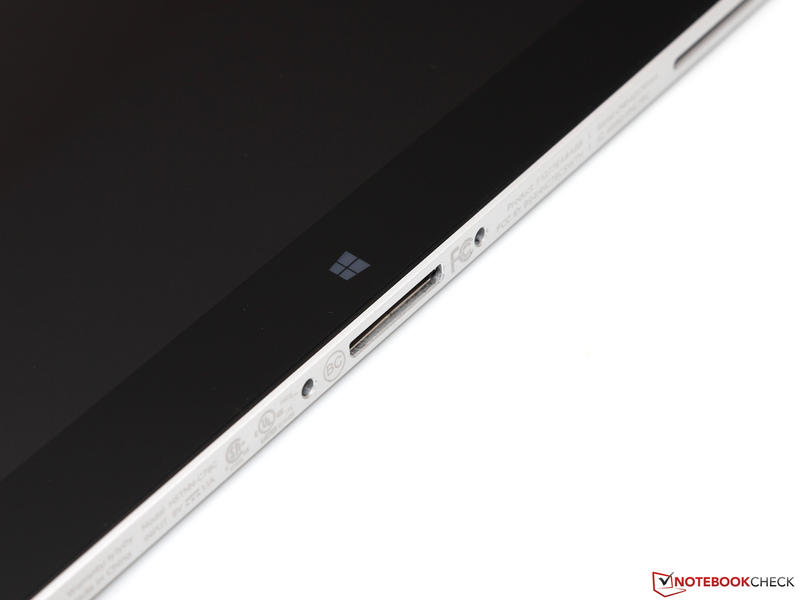 Only the Haswell-equipped and actively cooled Surface Pro 3 from Microsoft can clearly break away with a score which is almost twice as large. But what does that mean in practice? Sure: our test device cannot keep up with a modern ultrabook. However, the difference for many applications is smaller than one would expect: it does not even take 20 seconds for the system to be completely operational after a cold boot; Office programs or browsers open without any significant delays. Only very sophisticated or poorly parallelized software brings the processor to its limits - here the Core M (Broadwell) would be the better alternative. 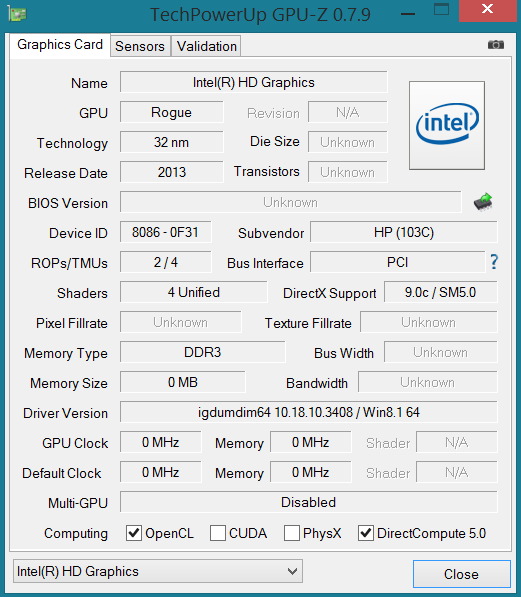 The graphics unit which Intel simply calls HD Graphics is essentially based on the older Ivy Bridge generation, but it has to make do with significantly less arithmetic units. 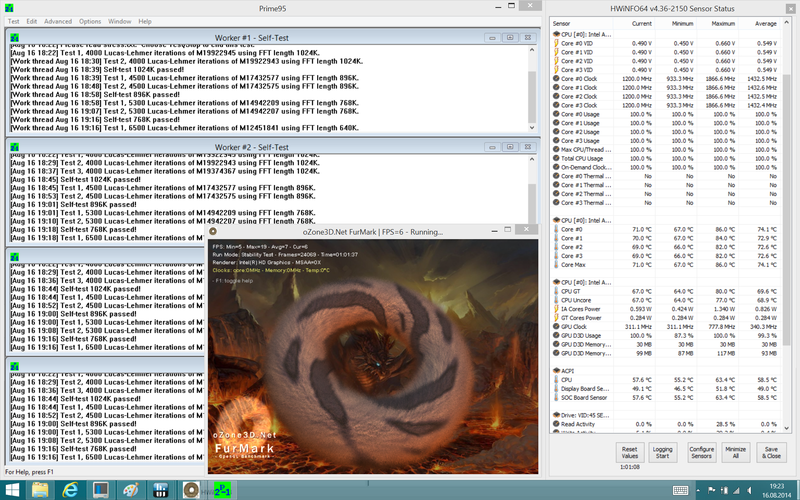 Just about 4 EUs (HD 4000: 16 EUs, HD 4400: 20 EUs) with a clock speed of a maximum 778 MHz allow for a relatively modest 3D performance, which is reflected by a 3DMark 11 score of 233 points. All the more impressive are the many multimedia talents of the GPU: while earlier Atom chips could partly not even handle 1080p videos smoothly, the Bay Trail can even cope with our 4K test video with 90 Mbit/s without complaining. 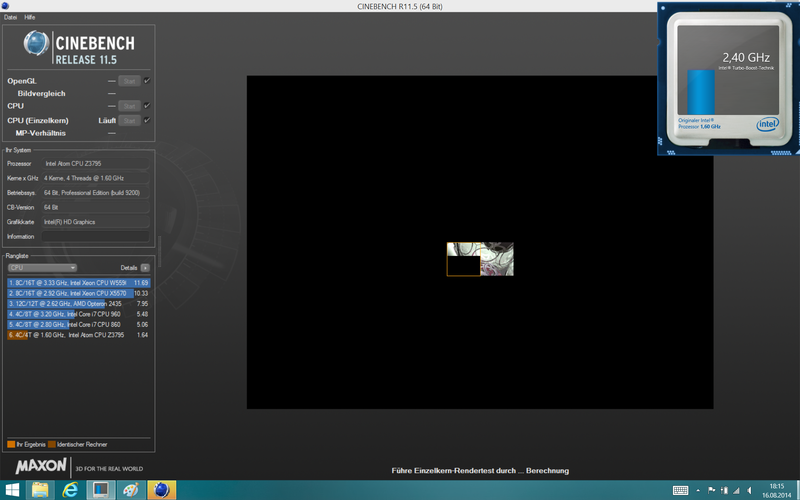 The Quick-Sync support is extremely useful for hardware-accelerated video conversion. Let's keep it short: for 3D games from the last 3 to 5 years, the HD Graphics (Bay Trail) is in general way too slow. Only a few, graphically simple games can be played smoothly with low settings, especially casual games as available in the Windows store. Alternatively, classics such as Half-Life 2 or Warcraft III are suited. In daily use, which means playback of videos or browsing, the tablet barely reaches more than 30 °C - apparently, the good heat conductivity of the metal chassis facilitates cooling. Even under full load we could measure at only one point a temperature over 40 °C. Consequently, the ElitePad can be held in the hand even under high loads. 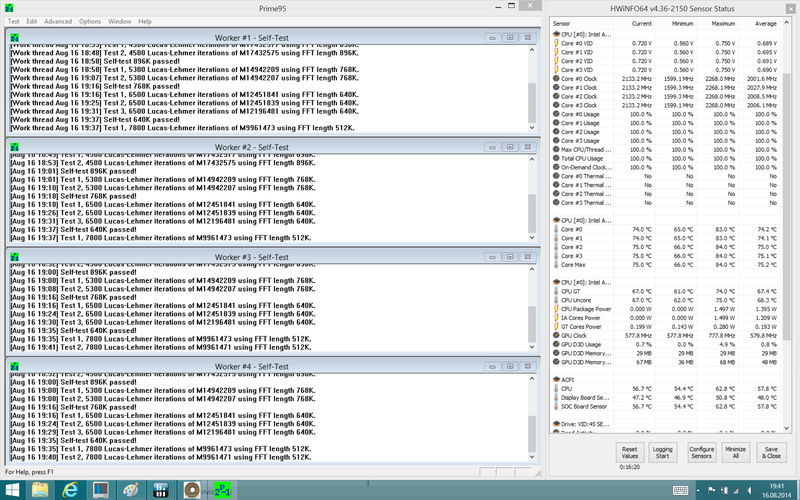 Also, the hardware within the chassis is far away from its critical temperatures. After our 1-hour stress test, the Atom Z3795 showed a temperature of just 70 °C, but it also has a slight clock decay of the processor (1.4 GHz, varying) and graphics unit (311 MHz). If the ElitePad is only loaded with Prime95, the CPU frequency is, with 2.0 GHz, considerably higher; practical limitations are therefore not expected. 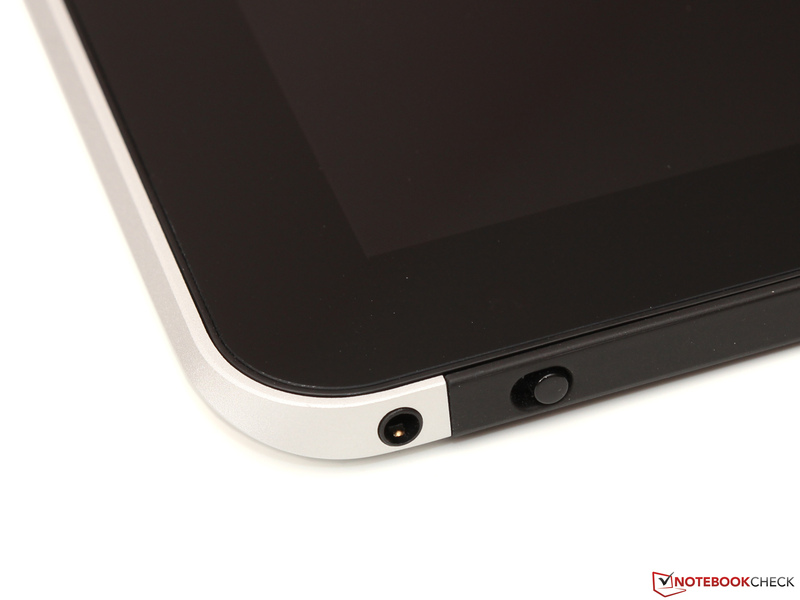 Two stereo speakers are mounted on the bottom of the HP tablet, which score pretty well considering that the device has a business orientation. High and intermediate frequencies are played back very clearly and - if wished - surprisingly loudly, such that even a small conference room can be adequately filled with sound. One should, however, not expect significant basses. With its minimum power input of only 2.7 to 4.4 Watt, the HP tablet does not have to hide behind its ARM competitors such as the Samsung Galaxy Tab S 10.5 (2.1-3.9 Watt) or the iPad Air (1.8-7.1 Watt). The extremely low full-load consumption seems almost more impressive: who would have thought a couple of years ago that you could run a Windows computer with a maximum 5.5 to 8.9 Watt? Even though the ElitePad does not count among the thinnest and most lightweight representatives within its class, energy content of its battery is, with 30 Wh, relatively low. Battery life is therefore slightly shorter than for the ThinkPad 10 for example, but it is still on a high level: our test (~150 cd/m² display brightness) with activated Wi-Fi and cyclic calling up of websites and YouTube videos is finished after over 7 hours - Lenovo's alternative lasts around two hours more. For more endurance one has to resort to one of the previously mentioned "Jackets" with optional additional battery. 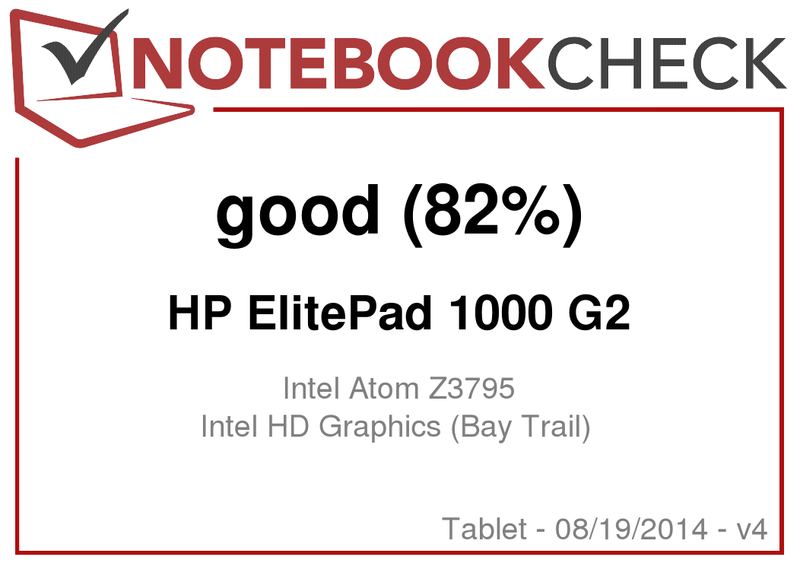 People trying to find an alternative to a classical business notebook are likely to be disappointed by the HP ElitePad 1000 G2: only a few ports, performance deficiencies, missing features - the list of flaws is long. 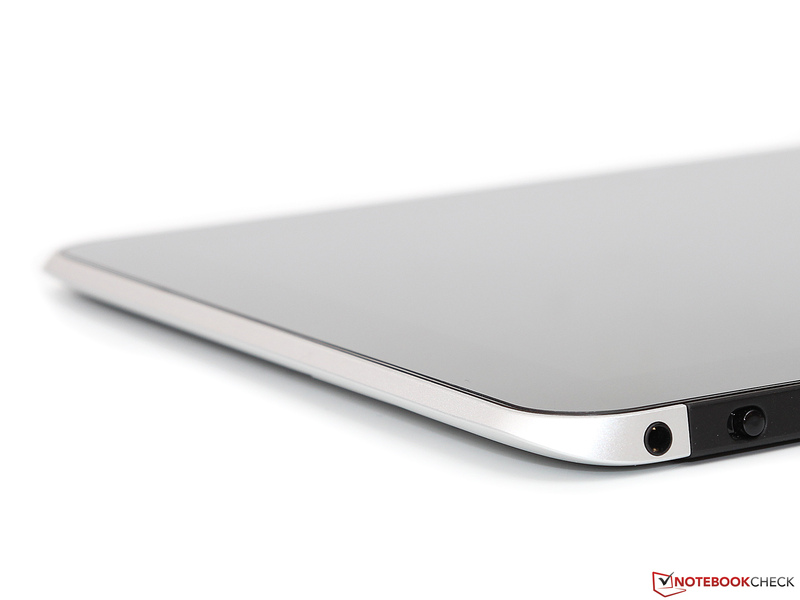 The actual intention of the tablet is, however, not to replace a notebook. 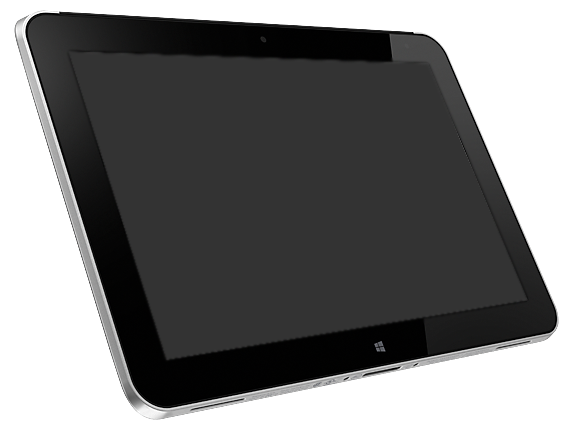 We consider the ElitePad as an especially mobile (secondary) device, which is best suited for meetings or journeys. Under this point of view, versatility of the product is the biggest advantage: in principle, performance is sufficient for all business tasks; additional interfaces are easily obtained through an adaptor or a dock. Without theses accessories, practical use is significantly restricted. Otherwise, HP did a good job: except for a few details, processing and quality are exemplary; temperature management (unlike other manufacturers) allows for use under full load. For a possible successor we would like to see a brighter display, maybe also better cameras as well as a slightly larger battery. It might be possible that the price decreases as soon as more competitors enter the market - even the technically less equipped entry-level model (only 64 GB eMMC, no WWAN) is, at currently 750 Euros (~$987), not a real bargain. ...is a reliable business companion. The subtle premium design shows value and elegance. ...as well as a headphone jack. 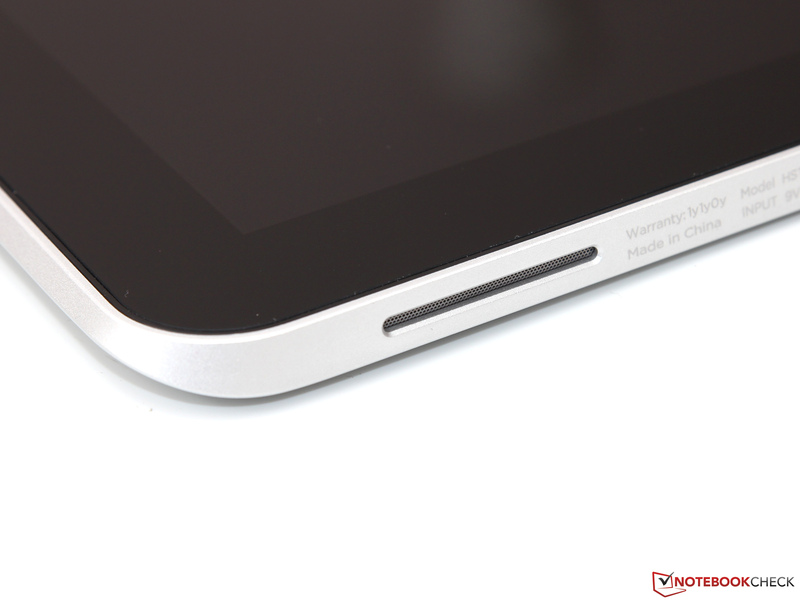 The ElitePad has integrated speakers. 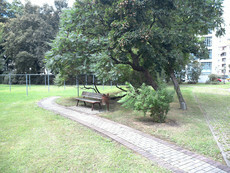 ...can be obtained through a docking station. 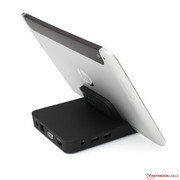 The dock also serves as a practical stand. With that, productivity can be significantly increased. 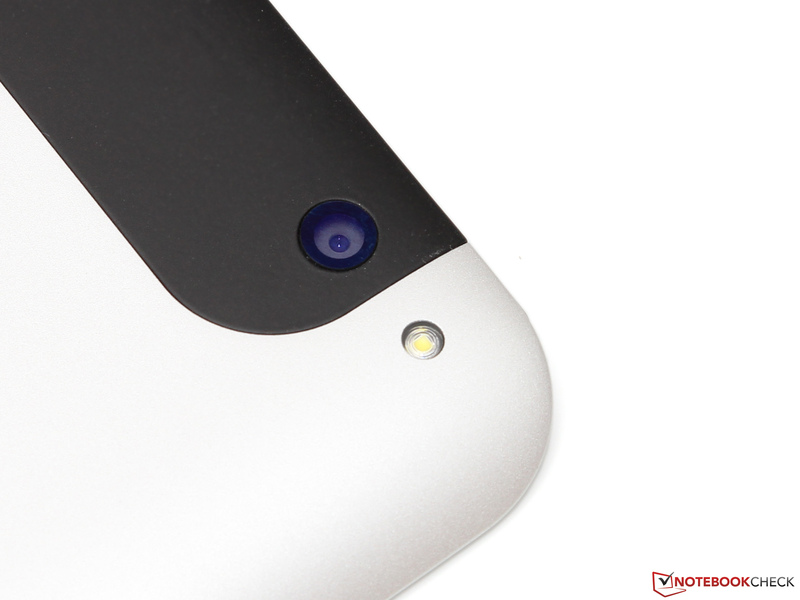 ...a current smartphone cannot be replaced by the back 8-MP sensor. 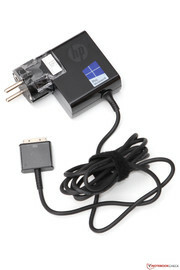 for the docking station, a 40-Watt adaptor is included. 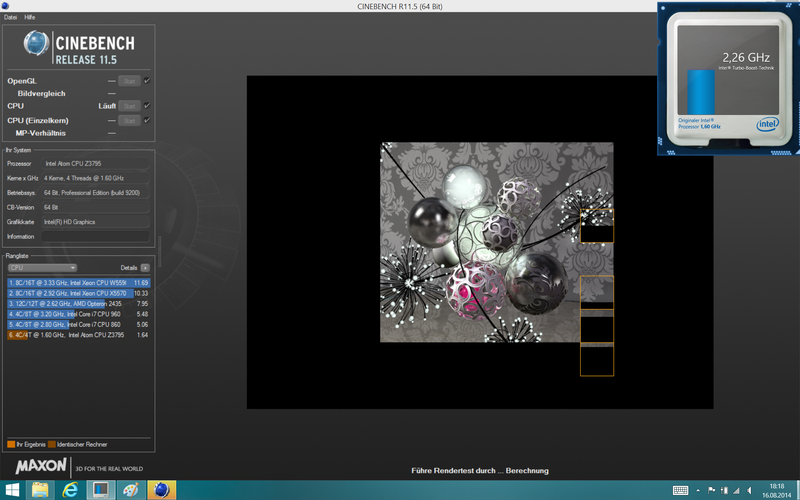 Due to Windows OS, the user has access to the entire software diversity of the x86 world. Even on the road one does not have to renounce to the most important desktop applications. We could not determine any huge flaws in our test - most likely the high price will scare off potential buyers. It really only uses an Atom processor? Especially for browsing or office applications, CPU performance is absolutely sufficient. Even slight multitasking is no problem for the Z3795.